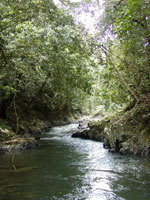 Batang Ai National Park is part of the region’s largest trans-national protected area for tropical rainforest conservation. 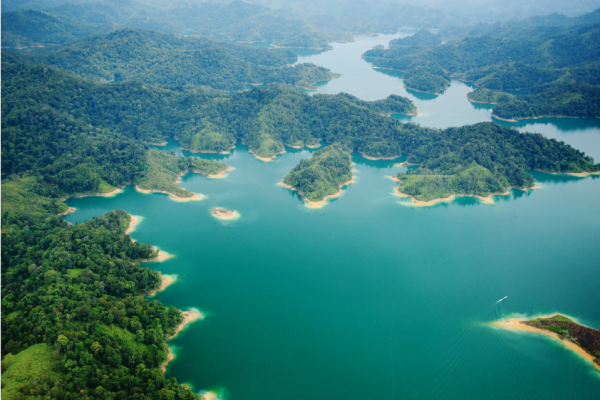 The 24 sq km park adjoins the Lanjak-Entimau Wildlife Sanctuary in Malaysia and the Bentuang-Karimun National Park in Indonesia. Together these totally protected areas cover almost 10,000 sq km and form a sanctuary for one of the few viable orang utan populations in Borneo (estimated at over 1,000 animals) as well as many other endangered species. For conservation reasons, Batang Ai National Park is the only part of this area open to visitors, but as it has the highest orang utan population density in central Borneo (up to 1.7 animals per sq km), there is a good possibility of seeing wild orang utan. However orang utan sightings should be regarded as a bonus not as a guaranteed experience. The Bornean orang utan (pongo pygmaeus) is found in the rainforests of Malaysian Borneo (Sarawak and Sabah) and Indonesian Borneo (Kalimantan). The Sumatran orang utan, recently identified as a separate species, is found in similar habitats in North Sumatra, Indonesia. Orang utans are one of the world’s largest primates, and are almost completely arboreal (tree living). 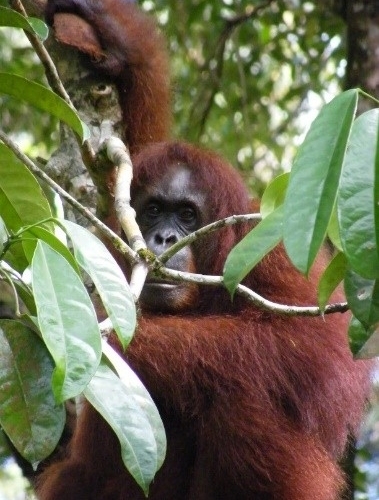 The word “orang” is Malay for “person” whilst “utan” is derived from “hutan” meaning forest. Thus, orang utan literally translates as “person of the forest”. A mature male has large check pads and a pendulous throat sac. Adult males can reach a height of 150 cm (5 ft), weigh up to 100 kg (220lbs) and have an arm span of 240 cm (8 ft). Females are about three quarters of the height and half the weight of the males. Both sexes are covered with long reddish hair. 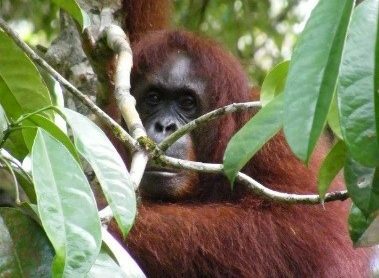 Orang Utan have a low reproductive rate – females reach sexual maturity at 12 years of age but generally don’t have their first offspring until two or three years later, usually giving birth to a single infant once every 7-8 years. Males reach sexual maturity at 15 but their cheek pads may not fully develop until a few years later. The life expectancy of orang utan in the wild is unknown but is thought to be less than in captivity, where some have lived to over 50 years of age. Orang Utan are primarily fruit eaters and spend most of the day roaming the forest foraging for food. They are particularly fond of wild figs and the pungent smelling durian. Although fruit is their most important source of food, they also feed on young leaves, insects, bark, flowers, eggs and small lizards. Each individual builds a new nest each night – and occasionally for a daytime nap – a safe resting place 12-18 metres (40-60 ft) up in the roof of the forest. Wild Orangutan are generally solitary. However, adolescents often gather in pairs and females occasionally form temporary groups of four or five. This rather lonely existence stems both from the relative scarcity of food in the rainforest and from a lack of predators. A mature adult roams a vast area of forest every day in order to find enough food to satisfy its healthy appetite. Its huge size also eliminates the need for ‘group defence’. Both Orang Utan species are highly endangered, and are totally protected by law in Malaysia, Indonesia and internationally. Today, there are an estimated 20-27,000 orang utan left in the wild (perhaps 20,000 or so in Borneo and the rest in Sumatra). Deforestation, human encroachment on their habitat, indiscriminate hunting and the live animal trade: all are factors that have contributed to a decline in their numbers. 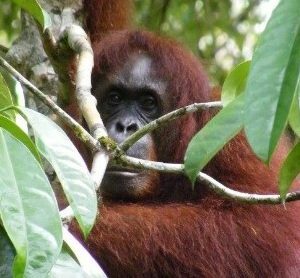 To gain a better understanding of the orang utan and re-introduce rescued animals into the wild, both the Indonesian and Malaysian authorities have set up rehabilitation programmes. There are five trails in Batang Ai National Park which showcase every aspect of the park’s terrain and vegetation, such as mixed dipterocarp forest, old secondary forest and active shifting cultivations areas, with ancient burial grounds scattered around the area. Visitors must be accompanied by a registered guide or park ranger at all times. More information on Sarawak Forestry official website. 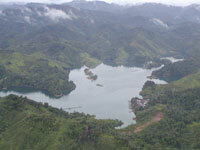 The Batang Ai hydro lake is about 275km (or 5 hours drive) from Kuching. Most visitors arrive as part of an organised tour group where all transport is included. Contact the Visitor’s Information Centre in Kuching for a list of approved tour operators.